Britain's biggest theatre-circus spectacular returns following its smash hit sell-out Fringe debut in 2018 – book now! 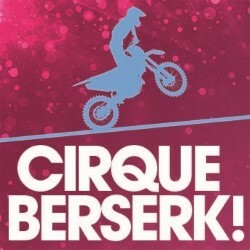 Showcasing the finest in traditional circus thrills and skills, Cirque Berserk! brings this treasured form of live entertainment bang up-to-date in a jaw-dropping spectacular created especially for the theatre. Combining contemporary cirque-style artistry with adrenaline-fuelled stunt action, this astoundingly talented international troupe includes over 30 acrobats, aerialists, dancers, drummers and daredevil stuntmen. Featuring the world's most hair-raising circus act, the legendary motorcycle Globe of Death. 'Fearless... you'll believe pretty much anything is possible' **** (Scotsman). ‘Insanely thrilling, happy-making entertainment' **** (List).